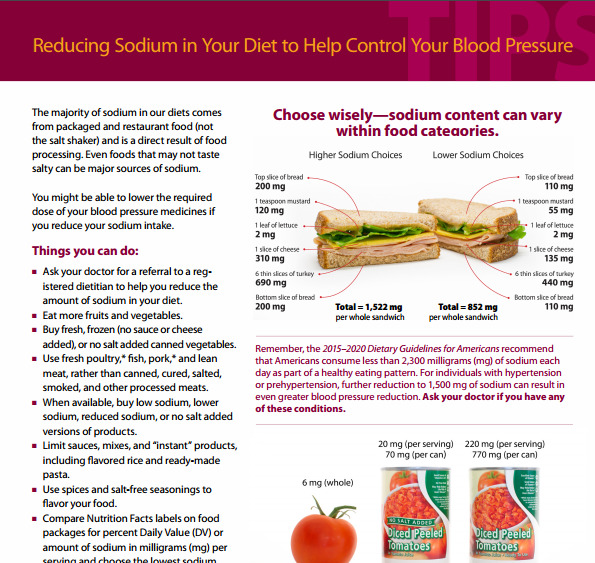 Did you know that the amount of sodium in the foods we eat is one of the biggest contributors to high blood pressure? And less salt in your diet can greatly reduce your chances of having a stroke or heart attack? Yes, salt intake leads to high blood pressure. It may be useful to understand that sodium — which makes up 40 percent of our table salt (sodium chloride) — makes us retain water which in turn increases the volume of blood in our bodies. When this happens, our hearts work harder to pump it. High blood pressure or hypertension has been called the “silent thief of youth” because it is not easily seen and felt. Sadly, nearly half of people in the United States don’t even know they have it. That is why it is a silent killer. It contributes to deaths of thousands of people in the US each year at it can lead to strokes, heart attacks and congestive heart failure. Given this risk from hypertension, you should start reducing your sodium intake by lessening the use of salt or by avoiding foods that are high in sodium content like the processed food so common in modern times. One British research team found out that by cutting salt intake by 3,000 mg per day — which is a little less than a teaspoon — you could reduce your chances of stroke by 26 percent and reduce chances of heart attacks by 15 percent. later in this article, you will know how much sodium you should ideally take in. Risk of stroke and heart attack are much higher for people who are overweight, those who don’t get exercise and those who have a family history of high blood pressure. So if you belong to this group, you will need to lessen your salt intake. So how much salt can you safely consume in a day to be in the safe zone? US dietary guidelines recommend sodium levels of 1,500 to 2,300 milligrams a day because those levels will not raise blood pressure. The US Food and Drug Administration has set the recommended “Daily Value” for sodium at less than 2,400 mg per day for Americans 4 years of age and older. According to the Institude of Medicine, the average sodium consumption in the US and worldwide is about 3,400 milligrams a day. So in terms of reduction, we could say that we should cut our average sodium consumption by at least a third. Cutting it in half is even better. Don’t depend on your sense of taste alone. We know that salty foods contain a lot of salt, but foods that don’t taste salty at all have sodium content, such as breads and cottage cheese. So if you eat bread lots of times a day, you will need to count the sodium levels to make sure your sodium intake is still within the recommended amount. Prepare your own food when possible. Buy fresh. Fresh meats have less sodium that the processed and preserved meats in grocery shelves. Consider other spices to add flavor. The National Heart Lung and Blood Institute has published this list of herbs and spices as salt alternatives for flavoring your food. Avoid salty snacks like chips, preserved foods, and more. Here’s a list of top saltiest snacks. Before dining out, do your research. Visit the restaurant’s website which should list the sodium content of various dishes served there. Alternatively, when you’re at the restaurant and ready to order, you can request that the dish be served without salt. The only thing you can do to avoid the “salted” versions is to know where your food came from and how it was processed before it reached the store. Or buy it frozen, in a box, with a label. Again, good eating comes down to education and information. Check online for nutritional information before you go if you are eating at a chain restaurant or fast-food outlet. Some independent restaurants also post this information on their Web sites. Request that no salt be added to your food. Beware of hidden sources of sodium such as sauces and dressings, and ask for these toppings on the side.